Despite the invention of chemical (aniline) dyes in the late 19th Century, thehill tribe artists represented by Above the Fray: Traditional Hilltribe Art largely use dyes and mordants exclusively derived from locally-collected natural materials and processed using traditional methods. The complex "recipes" for making these permanent dyes have been handed down for generations. The art is still alive today, and we have met master-dyers who are still developing new colors using traditional methods and materials. Natural silk is white or yellow (depending on the type of silkworm), most raw cotton is white, and plain hemp is light tan. Coloring these materials requires a complex knowledge of how to mix and process dyes. Natural materials can create dyes of virtually every color on the spectrum, from subtle gray to electric turquoise, from rich red to luscious orange, from earthy brown to brilliant magenta, and from deep green to canary yellow. "In the historic textiles, red and indigo were the most common ground-weave colors with a great variety of colors for the supplementary designs. Red dyes take well on silk and consequently, red has become the color of festivity and high status whereas cotton is difficult to dye red, usually resulting in pink or brownish hues." "Indigo, on the other hand, attacks silk due to its strong alkaline content, but is marvelous on cotton. Indigo was thus the color of everyday clothing and the farmers' clothing. Only rarely was indigo dyed alone on silk in historic textiles." 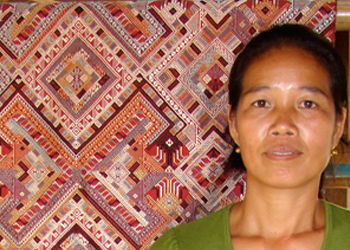 A master dyer, in front of one of the intricate silk shaman cloth of her design in Houaphon Province, Laos. Shaman cloths dyed with natural dyes, Indigo leaves, bark, and lac (placed on the textiles) are some of the natural dyes used in these pieces. 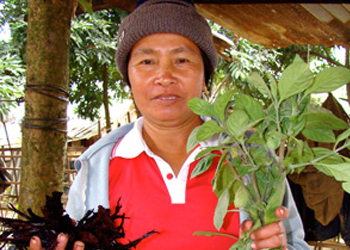 In Laos and Vietnam, red is most often obtained by harvesting the red-tinted excretions of insects from the family Coccoidea. Thousands of these tiny scale bugs colonize branches of suitable host trees and secrete a resinous pigment into which they lay their eggs. This sappy-looking material, called "lac," was traditionally processed not only for its red color, but also because, with increased acidity, it can be processed into clear varnish (hence the word, lacquer). The leaves of the plant Strobilanthes (the "indigo" plant) can be mashed and processed to obtain the richest greens, blues, and blacks. Indigo dyeing is woven into in the cultural lives of thehill tribe people of northern Vietnam, especially the H'mong and Dzao people whose traditional clothing are made from indigo-dyed handwoven hemp and cotton. Flowers, roots, bark, wood, fruit and even clay can provide distinct hues across the spectrum that can be dissolved and fixed into textiles. See the dye chart below for the various natural items used by thehill tribe artists. Natural dyeing is as much a science as an art. Dyers may alter the mix and amounts of dye, mordant, water or alcohol, vary the temperature or the cooking and soaking time, or experiment with multiple dyes, over-dyes, and rinsing and drying processes in order to obtain certain color subtleties, vibrancies and tones. 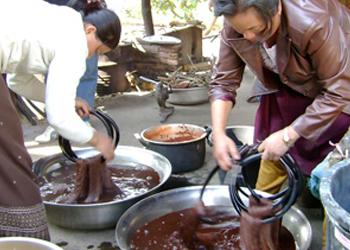 Dyes are also dependent on the quality and availability of raw materials and the unique preferences of community traditions and individual dyers. Women dyeing silk in mulberry dye. 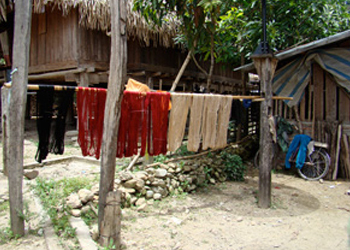 Freshly dyes skeins of silk drying in the sun in a village in Houaphon Province, Laos. Making dyes fast and maintaining their brightness requires a process using fixatives, called "mordants." Mordants make the colors "stick," or fix, to the fabric despite wear, sunshine, and washings. The primary traditional mordants in dyeing are tannin, lye, slaked lime, and alum. Tannin exists in many woods and gives a yellowish hue to all dyes; lye is made from wood ashes washed in water and provides potassium and sodium salts which fix dyes; slaked lime is a strong calcium mordant particularly suitable for certain yellows and blues; alum provides aluminum salts that act as an excellent mordant. Most weavers add mordants to the dye bath, a process known as "in-mordanting." Natural-dyeing fabrics or threads in a small village means that only small quantities of yarns for warp and weft threads are processed at one time. Thus, colors may shift in tone midway through a piece as that weaver moves from one season's silk to the next season's new dye lot. Expert dyers are often noted for their consistency in coloration. In the historic textiles, red and indigo were the most common ground-weave colors with a great variety of colors for the supplementary designs. 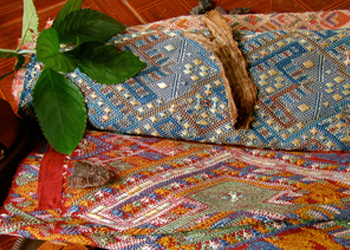 The silk artists of Houaphon Province in NE Laos are particularly expert with traditional natural-dye techniques, as the Tai Daeng, Lao Loum and other ethnic groups living in this remote region have raised, dyed, woven and traded silk for hundreds of years. The dyers of Houaphon also often play a substantive role in the process beyond being the artists who create and adhere color to the thread, and function as a "business hub" of a collection of local sericulturists (silk-raisers) and weavers. This role demands business savvy to understand the current market so that the overall investment of time and resources is justified in the rural communities where the sericulturists and weavers live. These "central-hub" master-dyers purchase reeled silk from the sericulturist and then process the silk for texture and color. The dyer is often also responsible for determining the intended piece's design elements and, working with a person who makes each design's pattern template (a one-month process), will provide the template-pattern as well as the silk to a weaver who can meet the standards of the dyer and the market. The warp and weft colors are pre-determined by the dyer, but the weaver will select where to apply each of the supplied supplemental colors that highlight the pattern. The weaver, upon completion of the textile (which may take up to four months), will be paid for her effort and talent by the dyer. It is then the dyer who gets the textile to its market to recoup the investment to sericulturists and weavers. One master-dyer may "contract" with a handful, or perhaps dozens, of weavers. Master dyer in Houaphon Province, Laos, showing two types of dyes she uses on silk. 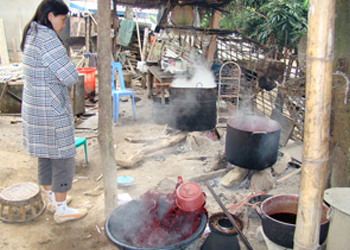 Our translator and cousin of the master dyer, in the "dye-works" of her cousin's yard in Houaphon Province, Laos. This business structure permits the weavers to remain in their traditional village to accomplish their expert work, allowing them to raise a family in the traditional home setting while earning money for family needs. This is often the only cash available in what otherwise would be a subsistence farming community. One of the unique characteristic of this region has thus been the empowerment of women within the culture, as they have traditionally managed the essential business associated with silk production and trade. Not all textiles woven in Houaphan Province are made through this culturally-created "cooperative." Many weavers use their own patterns, either handed down within the family or self-made, or hand-pick their own pattern without a template. They may purchase pre-dyed silk, or make a few well-known dyes and buy a few additional colors. Some weavers choose the convenience of chemical-dyes and factory-made threads; the use of polyester-blend threads are not uncommon in some villages. Modern conveniences and the value of traditional methods and materials weighs uniquely to each person, village and region – and market. The larger market is encouraged to support the inherent value of traditional methods and materials. Oh – it also assures that Above the Fray gets "first dibs" on the latest creations! We see and choose the textiles in the artists' homes, before they are distributed to another market. Fresh leaves and stem Lye (ash solution), white alcohol, lime.